There is a real story behind this scene. Not only is the artist a balloon pilot, but he spent nearly twenty years of his life doing this amazing activity. This lovely, tranquil experience actually happened while descending onto a river with fellow balloonists near a small North Carolina town many years ago. In that part of the country fall is ablaze with fantastic colors and the early morning sun-lit hues just add to the fiery display. Often the winds are very calm in the early morning and this is why balloons are usually launched only then or late in the afternoon, to manage their enormous globes of fabric that act like a sail in even light winds. Also in the early mornings in that part of the country, it is common to encounter banks of shallow fog or vapor rising off such bodies of water. 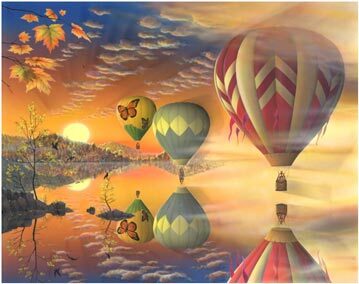 The mostly calm and placid appearance of the water surface reveals delightful reflections of the balloons as they drift down to the surface and sometimes touch it. This precise control is usually afforded the more experienced pilots and is a very impressive experience. This particular image enjoyed some notoriety after appearing on the cover of the Ballooning Journal, an international publication for ballooning enthusiasts.